From world-renowned architects Manolo Mestre and Juan Collignon comes Estate Otono. Mestre's and Collignon's holistic approach to architecture pays homage to the natural while incorporating the contemporary. A premiere eco-sensitive designer, Mestre embraces native simplicity and warmth of color to complement modern convenience, providing an alluring and meditative experience. A network of pathways through expansive reflection pools connects each unique structure, creating the illusion that Estate Otono is suspended over the powerful Pacific. At the center of Estate Otono stands the grand palapa. Nested beneath a palm thatched roof, sits an almost ethereal living and dining terrace. Steadfast ocean breezes and sun-bathed terraces bless this marriage of nature and nurture. Striking ocean vistas surrounds all points in Estate Otono central gathering area. A sustainable tropical wood dining table, created by local craftsmen for 12, provides an unmatched vantage point for the surf and sunsets. The tropical wood indoor dining table, set under a vaulted ceiling and soft lights, is a place to share a delicious meal and relax. Surrounded by colorful native art and craft and bordered by a contemplative pool, this comfortable space is a haven from the elements. Estate Otono graceful kitchen fits both form and function. Amidst ocean facing windows, everything from delicious simple Mexican fare to lavish haute cuisine is happily prepared. Charming yet modern, the kitchen opens onto an outdoor patio, bordered by a pond, where you will find an intimate breakfast nook. 63" HDTV with American, Canadian and Mexican satellite channels, Blu ray player and Apple TV. Home theatre and sound system. Board games and playing cards. Indoor outdoor dining areas (seats 12) and breakfast nook (seats ten). 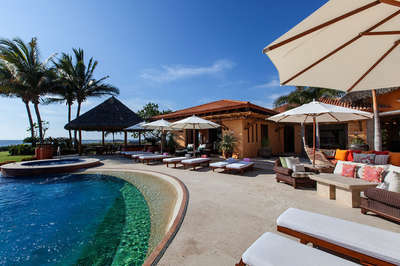 Access to Punta Mita Resort including golf, tennis and fitness centre. La Punta Estates is a private, gated community of exquisite custom design oceanfront residences, all of which are located on the prime point of the Punta Mita peninsula, which extends into the waters where Banderas Bay meet the Pacific Ocean. The Marietas Islands are visible offshore. Golf course fairways meander throughout this community, of both of Punta Mita's Signature Jack Nicklaus golf courses. 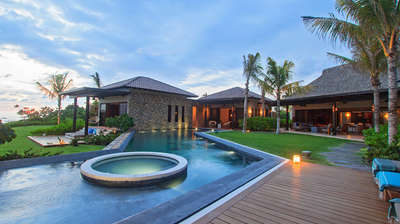 These homes are all less than a mile to the St. Regis Punta Mita Resort and its beach club. These estates offer more privacy, seclusion and security than any other of the residential communities within the Punta Mita Resort; also they are within walking distance to 'El Faro' one of the best surf breaks in the Banderas bay. These properties also offer access to the private Residents' Beach Club located on a stretch of white sand beach with very calm waters.